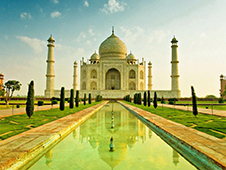 India – original country of the East, full of contrasts, bright colors and exotic customs. For centuries, it attracts travelers seeking to understand its religious secrets, learn all you can about ancient civilizations, rich flora and fauna of the local region. The many faces of India attracts a variety of tourists. North Goa – a paradise for young people, ready to be entertained around the clock. There are many budget hotels, nightclubs and discos. For those seeking a quieter, relaxing stay there in South Goa. Ocean people come with money, and India meets its golden beaches, beautiful tropical scenery and luxurious hotels. Fans flock tours usually deep into the peninsula. They are interested in the "Golden Triangle", within which is Delhi, Jaipur and Agra. For these travelers, India has plenty of masterpieces of architecture and historic sites. Getting around this vast country, of course, it's best to drive. Rent a car in India is better not to themselves, but through the site bookingcar.ru. This online book simplifies life tourist. Rental cars are available in all airports in the major cities of India. Particularly dispersed on Indian roads is physically impossible, as the road surface is poor quality (if any), and in the cities of many "speed bumps" appear anywhere. The speed limit in built-up areas in India - 50 km / h.
In a country with a billion inhabitants of excess cars - one of the key problems on the roads. Find free parking spot in the big cities is very difficult, so the Indians skillfully put the machine close to each other. Many of the parking lots, including at the hotel, free of charge. The cost of paid parking on the territory of the parking lot - one of the lowest in the world (less than $ 2 a day). Tourists, springs from a car in India should know that the laws in different states may vary. For example, in Kerala operates a total ban on alcohol for drivers. On the rest of the territory of India allowable rate of alcohol in the blood - 0.3 ppm. In India, there are practically no signs, road signs and markings. Along with cars moving on the streets of elephants, camels and rickshaws. And pedestrians, and drivers often ignore traffic rules, so alien driving should be very careful to understand all this chaos. Motorist, preparing to overtake, must notify its intention to signal horn. In India, a pedestrian crosses the street - the norm. These maneuvers have to be ready. In Calcutta should clearly respond to the traffic signals. In other cities, it is not necessary. The driver of the rental car, it is desirable to have the rights of the Indian sample, in case of DCF to get insurance. Movement in India the left. If the road becomes a cow, a motorist must stop. The driver, who shot down the animal gets 7-year prison sentence. At the intersection of the first passes the one who had reached him and signaled. Priority on the road has more headroom and powerful trucks. Main motor fuel in the country - diesel. Petrol in India is difficult to find even in big cities. The average cost of a liter of diesel - 55 rupees, gasoline - 70 rupees. Prices in different cities across the country may differ slightly. In India, all long-distance trails with quality coverage are paid. For travel on them the driver has to pay 10-30 rupees. The roads in the cities themselves, in general, satisfactory, but in the provinces are often narrow, unpaved, with a lot of sharp turns. For a long time we\'ve been engaged in extreme driving. Recently we were in Saudi Arabia. We rode along the desert. It\'s especially beautiful at the end of the day. There were admiration and danger and a host of other things. We rented a car via bookingcar eu. It\'s a very useful site, because it compares all world providers and gives a full base of actual options. It is convenient that you can pay everything without fees directly on the site. There are excellent offers, which we always take.